The 100 continues the march towards inevitable War as some of the characters work to find a more peaceful solution that will benefit as many people as possible. One thing has certainly been made clear this season; Octavia is ready for War and nothing is going to dissuade her from marching into Shallow Valley to take it by force. This isn’t something many people agree with but Octavia’s leadership style means that there’s no reasonable way to oppose her. This leaves Clarke and Bellamy to work behind her back in order to stop a War that will result in a significant amount of bloodshed on both sides. As with anything on this show there are difficult moral questions to consider with the two main solutions involving someone being killed. The obvious solution to the problem is to kill Octavia and have someone more reasonable in charge who is willing to act in the best interests of all the people rather than someone more determined to defeat her enemies than protect her people. What stops this from being the plan is that Bellamy can’t bring himself to kill his sister nor will he participate in a plan that will result in her death so another avenue has to be explored instead. Of course this screams double standard on Bellamy’s part because he is willing to kill someone else but it’s also something that makes sense given the familial bond at play here. Even though it’s possibly the most effective way to end this conflict Bellamy could never live with himself if he was the one to end his sister’s life. Clarke accepts that which means that she is also willing to go along with the alternate lethal plan. Since Octavia’s strategy hinges on the worms being used to kill the prisoner population so that Wonkru can march into the valley unopposed it stands to reason that removing the worms will at least delay Octavia’s invasion while she thinks of another plan. This means killing Cooper who is one of the few people who has access to the worms. If she dies and it is made to look like an accident before pushing the fail safe button to kill the worms then Bellamy and Clarke should be exempt from suspicion. It’s a brutal idea because Cooper is essentially innocent in all of this as all she does is follow orders in order to keep herself alive. Nobody who follows Octavia’s rules can be completely innocent especially in her case after what she has been doing in order to breed the worms but in the broader context she is only acting out of fear and doesn’t bear the same level of responsibility that Octavia has. 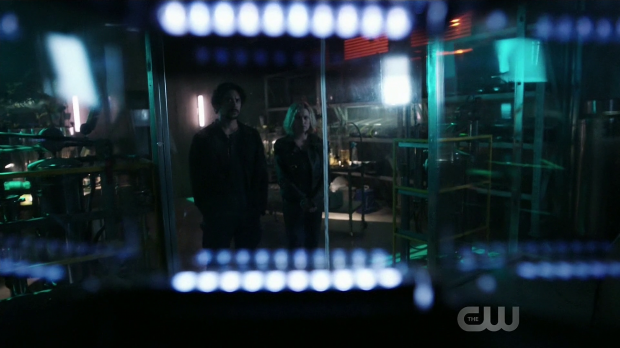 The episode plays Cooper’s death as a tragic murder with Clarke and Bellamy looking small as they stand watching which makes the moment look both sinister and uncomfortable. What they have done is wrong and it’s clear that even they believe that Cooper doesn’t deserve it but in their mind it’s the most necessary course of action because it’s better than all the deaths that will happen after Octavia begins her attack on the valley. It’s interesting how quickly Clarke and Bellamy fall back on old habits out of apparent necessity and the brief exchange where Clarke assures Bellamy as well as herself that they are doing the right thing shows how tired both of them are of making tough decisions. It’s a really bad plan for so many reasons but mainly because it doesn’t work because Octavia anticipated that there would be an attempt at sabotage so kept the details of her real plan secret to most. Her actual plan involves using the worm eggs in some way rather than the worms themselves so she knows that killing Cooper is an attempt to make the destruction of the supply of worms look like an accident. She immediately arrests Clarke for the part she played and challenges Bellamy to stand up for Clarke to give her an excuse to do the same to him. It’s not clear but it’s possible that she has similar issues doing harm to Bellamy but will still go through with it if she has to. For the sake of appearances she may be pretending that she doesn’t have enough evidence but her threat makes it clear that she will make an example of him if she has to. Bellamy using the algae solution to put her in a temporary coma is an interesting solution that seems to be able to please everyone in the meantime. 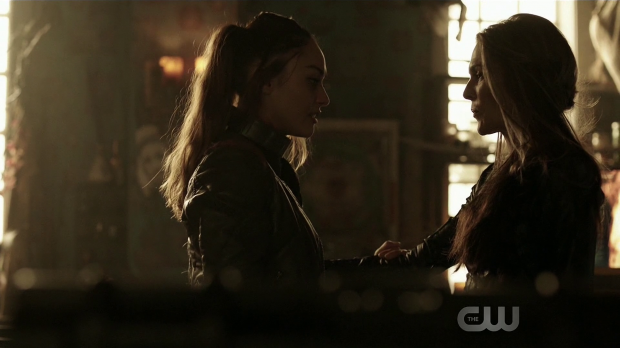 Diyoza has made it clear that total surrender is all that she will accept in order to let Wonkru settle in the valley so removing Octavia from the equation in order to put everything in place so that it’s too late for her to do anything about it by the time she regains consciousness is a great idea. There is a potential wrinkle in that plan as it’s possible that Diyoza won’t accept a surrender from anyone except Octavia which means that the War will go ahead anyway. Another possibility is that Octavia wakes up and is ready to take back the rest of the valley violently so there are still issues with this idea. The characterisation of Monty this season has been really interesting as he is one of the few characters who actually seems to have held onto lofty principles even though he’s under the worst of conditions. He comes up with another survival alternative involving using algae to accelerate the growth of plants which will allow Wonkru to survive without needing to settle in Shallow Valley. Life might not be easy but it will be possible and they can live in relative peace without having to battle anyone for their own right to exist. Of course his viewpoint isn’t really shared by many people and he finds himself in direct opposition to both Clarke and Bellamy. His suggestion to kill Octavia is delivered wonderfully by Christopher Larkin as a way to point out the double standard at play while showing how much he disagrees with them. Monty stands in clear judgement of their actions and outright condemns them. Harper backs him up and they agree to be out for themselves from now on meaning they won’t participate in the upcoming conflict. Something tells me that Monty will come to a bad end this season because he isn’t going along with the plans others have so it feels like it’s only a matter of time before his peaceful nature and public condemnation of violent solutions will rub someone up the wrong way forcing them to make an example of him to further show what disloyalty means. There will be a certain poetry to someone who doesn’t believe in violence ending up in an arena and having to fight for his life. Despite Diyoza being unwilling to budge on the notion of allowing Wonkru to settle peacefully unless they surrender this episode adds further layers to her character through exploring her desire to live a peaceful life. The revelation of her pregnancy last week has added greater intrigue because she is someone with something very important to lose rather than being a tyrannical leader looking to constantly show how strong willed she is. Her conversation with Kane where they both imagine what can be built in the valley and how it can become a home for all of them is brilliantly done. Henry Ian Cusick and Ivana Milicevic’s measured line delivery as the picture takes shape in their heads is note perfect and highlights how both characters ultimately want the same thing. Diyoza wants a peaceful world for her child to grow up in and Kane just wants a peaceful existence for all free of the strife that has been constantly endured of the past few years. They are noble ambitions with the sticking point involving Diyoza and Octavia’s shared stubbornness making them both want to be on top rather than working together for a better world. I really like the relationship that has developed between Kane and Diyoza because of how complex it is. Kane still doesn’t approve of Diyoza enabling Abby’s addiction in order to find a cure for the lung disease threatening her people and he isn’t shy about letting her know that. He points out how dangerous it is to adopt an “ends justify the means” approach to morality and how that can end up devaluing everyone in the long run. Kane speaks from experience as he knows what that’s like and there’s also the sense that Diyoza knows it too but still stands by her decision. Outside of that they do see eye to eye on a number of important issues and Kane won’t let his feelings for Abby cloud his judgement when it means working towards a peaceful resolution. The addiction is a separate issue that can be solved later. The depths of Abby’s addiction come into play in a big way when Raven discovers why Abby doesn’t need a collar. Diyoza uses the pills to control her so she doesn’t need one. Raven and Abby’s conversation about the addiction is really powerful especially when Abby claims to need them after the City of Light debacle which is a personal sore spot for Raven. Ultimately it causes their relationship to dissolve to some degree particularly when Abby activates her shock collar. It’s powerful, shocking and really tests the previously strong connection between these two characters. 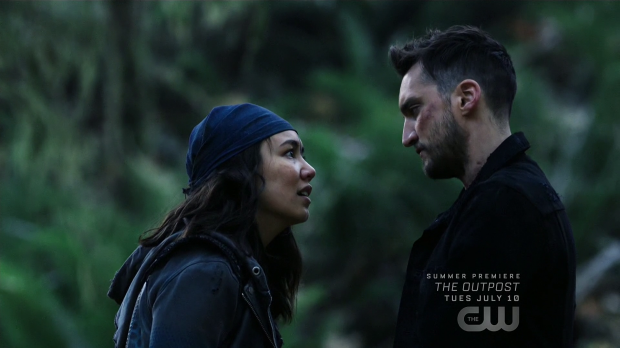 McCreary as Murphy and Emori’s hostage plays out in a predictable way but still an interesting one. He isn’t great as hostages go because Diyoza won’t negotiate with Murphy and Emori because she would rather remove the weakness that comes with McReary being captured. As far as she’s concerned he’s on his own and not her problem any more so there is no chance of trading one prisoner for another. It’s cold but fits with Diyoza’s established character and shows McCreary exactly how valued he is in the grand scheme of things. As such he agrees to help Murphy and Emori in exchange for regaining some of his credibility. The plan involves McCreary pretending to turn them in so that they have a chance to rescue Raven. It might be enough to restore some of Diyoza’s faith in him so everyone can benefit from it. I really enjoyed these scenes as McCreary is a fun addition to the Murphy and Emori dynamic. He has clear goals and his loyalty very much belongs to whoever is most likely to leave him alive for the longest amount of time. It’s a reasonable approach and easy to see how that might make trusting him more difficult. This is acknowledged but Murphy doesn’t really see any other options at this stage so putting their tenuous trust in McCreary is about all they can do at this point. How this will play out is up in the air but it does fit with Murphy’s tendency to take lots of risks. It’s interesting to see what this does for the Emori and Murphy relationship. Seeing how Murphy handles a crisis reawakens the feelings Emori has for him as she makes clear to him though she also knows that once Murphy is safe again he will go back to his self destructive ways. This justifies her decision to not act on her reawakened feelings because she wants to break this relentless cycle and isn’t emotionally equipped to handle Murphy going back to the way he was. The most problematic part of the episode comes with Echo’s insistence that Shaw needs to be killed because it leaves the prisoners without a pilot for the ship which makes them far less dangerous. Raven resists initially but comes around to the idea by the end of the episode. This doesn’t really sit right with me because it doesn’t feel like something Raven would ever agree with no matter how desperate the situation may seem. One consistent thing about her character has been the principles she lives by and her agreeing to have someone killed that she has become somewhat close with just doesn’t work. Another strong episode that creates so much tension associated with the upcoming conflict. Bellamy’s double standard associated with his unwillingness to kill Octavia against his willingness to kill Cooper for the greater good works really well as it’s easy to understand where he’s coming from. Clarke and Bellamy falling back on old habits when it comes to protecting people is interesting to see as is Monty’s complete opposition to it. Cooper’s death is played as a tragic murder with her clearly being the victim of Clarke and Bellamy which is really effectively executed. Having the plan not work because Octavia has anticipated the sabotage and kept her true plan secret is a great reveal that increases the tension by putting Bellamy in the position of having to pretend that he doesn’t support Clarke. Tricking Octavia into ingesting the algae culture that will put her in a coma was a surprising ending that may not work if Diyoza refuses to accept surrender from anyone except Octavia. Alternatively Octavia could choose to wage War when she wakes up inside the valley. The relationship between Kane and Diyoza continues to be complex. On one hand he disagrees with her keeping Abby on the drugs to keep her functional because he thinks that an “ends justify the means” way of thinking is dangerous. On the other hand they both have similar ideas when it comes to building a better and more peaceful world though the obstacles against that are made very clear at this point. The depths of Abby’s addiction are clearly shown when Raven catches her out and Abby activates her shock collar therefore damaging their relationship possibly irreparably. 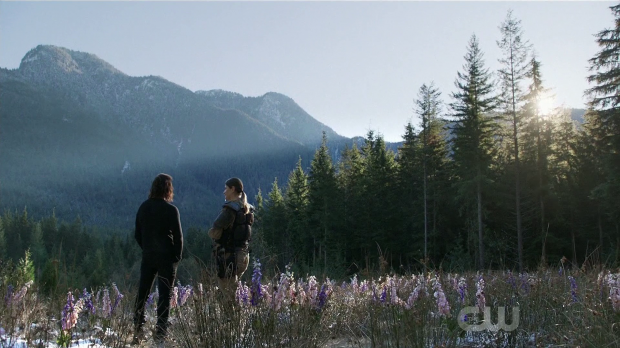 McCreary as Emori and Murphy’s hostage makes for some great scenes that highlight the difficult position they are all in when it is made clear that Diyoza doesn’t care about him and that he’s the only chance they have to rescue Raven. Having Emori’s feelings for Murphy resurface with the caveat of Emori refusing to give into them because she suspects that Murphy will fall back into his self destructive ways once they are sage again makes for interesting drama as well. The one thing that doesn’t work is Raven eventually agreeing that Shaw has to die. It doesn’t fit with her character or her established principles. You might be right about Raven to some extent. But Raven hasn’t frequently been in a position of making live-or-die decisions herself. We’ve seen her comment from the sidelines in God Complex but we have also seen her refuse the medicine for Luna’s child in early S4. Notably she put pressure on Clarke to make the list at the same time knowing that Clarke was more able to make that type of decision than she was. So I’m not sure your conclusion on Raven is altogether self-evident and for me, seeing the signs of early S1 in raven is really rewarding and possibly a long-time coming.